On March 22nd, LinkedIn announced that they had officially crossed the 100 Million member mark. However, they might have actually crossed the 100 Million member milestone back in January. I started seriously exploring LinkedIn Ads ever since they announced that they emerged from beta on 1/26/2011, and I noticed that once you configure an ad, LinkedIn displays the total estimated audience based on your targeting, including geography, company, job title, group, gender and age. When I first looked into LinkedIn Ads, I noticed that the total target audience was somewhere over 99,000,000 when I did not make any targeting selections. I figured this was representative of the total estimated number of LinkedIn profiles worldwide. Because the figure was so close to 100,000,000, I made a mental note to come back and check in to see if and when the estimated audience crossed the 100M mark. Back on January 30th, I took a screenshot of a targeted audience of 101,382,559. I was planning on writing about this for quite some time, but I kept prioritizing other posts, so I was bummed when I saw LinkedIn’s official announcement that they crossed 100M profiles on 3/22. In hindsight, folks at LinkedIn probably would not have been too pleased if I had announced that they had crossed 100M members before they did, so perhaps it all worked out for the best. Of course, the target audience figure is just an estimate (as is the size of your 2nd and 3rd degree connections, not to mention your total network size! 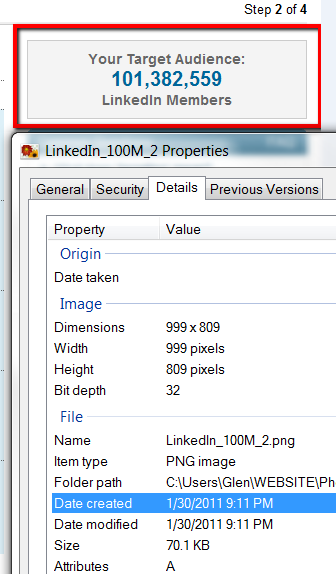 ), so perhaps the 101M+ number I saw wasn’t actually representative of the real number of profiles – only LinkedIn would be privy to the exact figure. Interestingly, when I just went back into LinkedIn Ads to see what the number had gone up to, it’s now magically locked at 100,000,000. However, when I target North America and more specifically the United States (sorry Canada! ), I see an estimated target audience of 44.6M people – so as long as as you perform some kind of targeting, you can see dynamic figures. If you haven’t already, I strongly encourage you to explore LinkedIn’s Ads – you can find the estimated number of LinkedIn profiles matching any combination of geography (continent & country), company (name or category), job titles (specific or category), LinkedIn group, gender and age. While some would argue that LinkedIn Ads are not as “targetable” as Facebook’s or Google’s – LinkedIn’s professional/work related data (e.g., companies, job titles, etc.) is much deeper and more thoroughly populated (and thus leverageable!) than Facebook or Google for employment advertising for sure!